Trump: Curbs On Gun Sales Would Make 'No Difference' In Texas Shooting : The Two-Way Despite reports that the suspect's criminal record should have stopped him from legally buying firearms, the president said tougher vetting wouldn't have prevented the church attack. 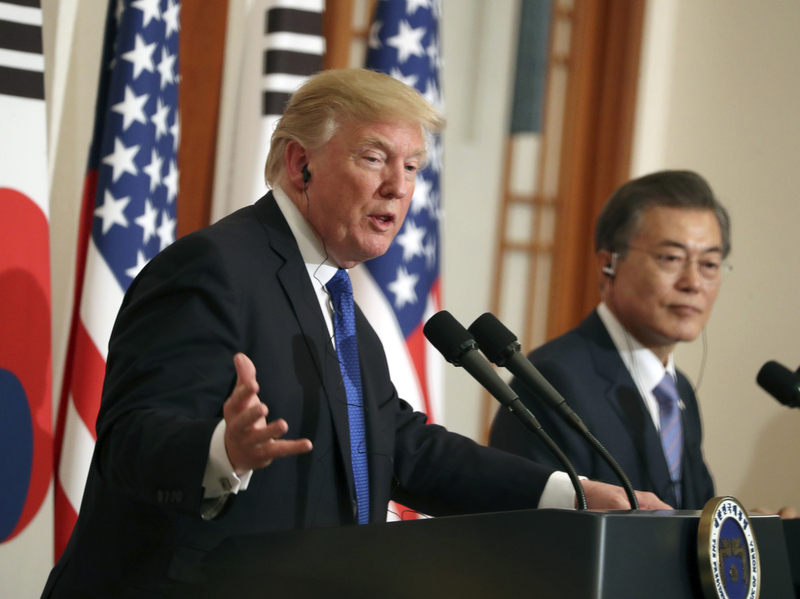 President Trump speaks as South Korean President Moon Jae-in looks on in a joint news conference at the Blue House in Seoul, South Korea, on Tuesday. The president bristled at getting the question while "in the heart of South Korea," in a news conference focused mainly on North Korea and bilateral trade issues. "You're bringing up a situation that probably shouldn't be discussed right now, we should let time go by," he told the reporter, but then added: "I will certainly answer your question." "If we did what you're suggesting, there would have been no difference three days ago," the president said of the mass shooting at the First Baptist Church in Sutherland Springs, Texas, that resulted in the deaths of at least 27 people, including the shooter. "And you might not have had that very brave person who happened to have a rifle in his truck go out and shoot him and hit him and neutralize him," he said, referring to Stephen Willeford, who drew a rifle from his home safe and exchanged gunfire with the suspect, 26-year-old Devin Patrick Kelley. Authorities say they believe Kelley shot and killed himself with his own weapon after leading Willeford and another man, Johnnie Langendorff, on a high-speed chase. "I can only say this: If he didn't have a gun, instead of having 26 dead, you would have had hundreds more dead," the president said. "So, that's the way I feel about it. Not going to help." However, as NPR's Richard Gonzales and Camila Domonoske reported earlier, Kelley was convicted in a military court of assaulting his then-wife and stepson while in the Air Force at New Mexico's Holloman Air Force Base. He served one year in a military prison as a result of a plea deal and subsequently received a bad conduct discharge. Under federal law, his conviction should have prevented him from purchasing the assault-style rifle he used in the attack and two other handguns. "Initial information indicates that Kelley's domestic violence offense was not entered into the National Criminal Information Center database by the Holloman Air Force Base Office of Special Investigations," Air Force spokesperson Ann Stefanek wrote in an email. Trump also responded to a question about the shootings at a news conference with Japan's Prime Minister Shinzo Abe in Tokyo on Monday. He said: "This isn't a guns situation." "Mental health is your problem here," the president said. Based on preliminary reports, the attack was carried out by "a very deranged individual," he said. "Fortunately somebody else had a gun that was shooting in the opposite direction, otherwise ... it would have been much worse," the president said. "This is a mental health problem at the highest level." "A very, very sad event, but that's the way I view it," he said.